The Salford Diocesan Sacramental Programme which first started in 1984 runs in our Parish each year from September until July. Ahead of September, parents of baptised children entering Year 3 are invited by the Parish Family to present children to prepare for, and celebrate, the three Sacraments of Reconciliation, Confirmation and Eucharist. These Sacraments of Confirmation and Eucharist complete the process of Initiation, which began with at Baptism. They are called “Sacraments of Initiation” and they are the ways God has given us to become full members of his Catholic Church Family. The answer “Yes, I do” to this question was the promise made by parents before God and his Church that they accepted this wider role as parents. As well as being the first teacher of children in many of the ordinary ways of human living, parents also accept that they are the first teachers of children in the ways of faith. So, it is the responsibility and privilege of parents to bring children to the sacraments. This starts by a formal enrolment in the Programme, celebrated together in the Presentation Mass. and to receive Jesus in Holy Communion for the first time (usually late June/early July). On that Sacramental Journey, children also have a first experience of the Sacrament of Reconciliation, at the start of Advent. This is not a Sacrament of Initiation but it is a key way of preparing to celebrate the other two Sacraments. Reconciliation restores our life with God and with God’s family, the Church, when we have damaged that by sin. It restores us to the innocence of the day we were baptised. Just as parents do not try to teach children everything themselves, so in terms of faith, there are others to help. The Programme relies on a mature and collaborative partnership between Home and Parish to provide the best environment for children to grow in their understanding of the faith and how to live it. The Parish founds and runs its own Catholic Schools, which is a key partner with the Parish in supporting parents. Children who are not in a Catholic School and also older children are welcome to join the Programme, and our team of parish faith-friends will work closely with Father Tim to provide additional support. which will remain with them for the rest of their lives. We hope this will be a very positive experience, and we trust that parents will support them at every step of the journey. It is always wonderful at Sacramental Programme time to witness parents taking that responsibility to support so seriously. then we will have to ask parents to defer for a year, as children would simply not be ready for the Sacraments. if they are not prepared, leaving them to go through life not knowing what it had all been about. understand more deeply the Church's modern teaching about the Sacrament of Confirmation. Our Parish Guidance for the dress code for both Confirmation and First Holy Communion is published below. We are already starting the current cycle 2013-14: see Enrolment Form and Timetable below. As a parish family, we have developed an agreed protocol over recent years to help bring to our celebrations of the Sacrament of Confirmation the dignity and reverence they deserve. CANDIDATES. We ask that our Candidates wear appropriately smart clothing which is NOT School Uniform (as it is a parish celebration) and which is not as formal as the clothing they will wear at First Holy Communion. An example we have given in the past is what our children would wear if invited formally to a family member’s Baptism: for boys, a shirt and tie, trousers, maybe a waistcoat; or girls, a smart dress or smart blouse and skirt. It would not be acceptable to wear sports gear, jeans, very casual clothing, printed T-Shirts for pop stars, football teams, etc. SPONSORS. Equally important is the dress code for chosen Sponsors, who alone present the Candidates for Confirmation. They are formal representatives of the Church family, committing themselves to passing on the Catholic faith to our children. Sponsors should dress in a way that reflects this unique privilege. GUESTS. We ask that all our guests work with us to ensure the right and reverent atmosphere in Church which our children deserve. When we gather in Church, we gather in God’s House, which is what we call “Sacred Space”. So there is to be no chatting, no mobiles (including texting and games! ), no swearing, no chewing, no eating, no drinking, etc. Dress code for everyone should be appropriate – no caps, no flimsy sports vests, etc. In many ways, the dress code for boys is less complicated and less expensive. It is essential that all boys should wear a WHITE shirt, recalling the day of their Baptism when they first wore white to show that they were "clothed in Christ". 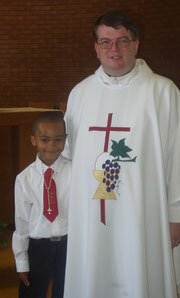 The celebration of First Holy Communion completes what began with the first Sacrament, Baptism. Smart dark trousers and smart shoes are appropriate to underline the formality of the day. Families may choose that their children wear a suit or jacket or waistcoat, as preferred. Nearly every child wears one of the special red commemorative ties which include an embroidered Chalice and Host symbol with year date included. These are available at just £4.50 from St Mary's Piety Stall or from Mrs Cathy Cullen at St John Fisher Church. Any particular questions can be addressed in detail at the Parents' Meetings. In contemporary times, the Church constantly calls for moderation and appropriateness for our girls celebrating First Holy Communion. It is not a wedding day with over-ornate dresses and long trains or a time for so many accessories that hands are not free to actually receive communion. The vast majority of children wear a dress, and the important thing is that this is recognisably WHITE, for the same reason as for the boys - to show the very strong link between Baptism and First Holy Communion. This white can embrace the range of whites which are readily avaialble (brilliant white, off white, cream white, magnolia white, etc.). 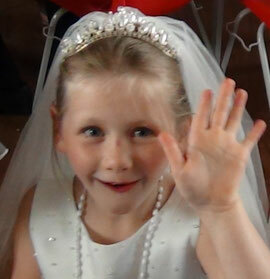 Many girls choose a simple matching white veil which does not cover their face and obstruct receiving Holy Communion. Other items such as the colour of shoes, the choice of socks or stockings are all at the discretion of parents. Again, particular questions can be answered at the Parents' Meeting in June.